Thank you to the fab folks at Mohawk for sending me the rug to review! All opinions are 100% real and absolutely mine! 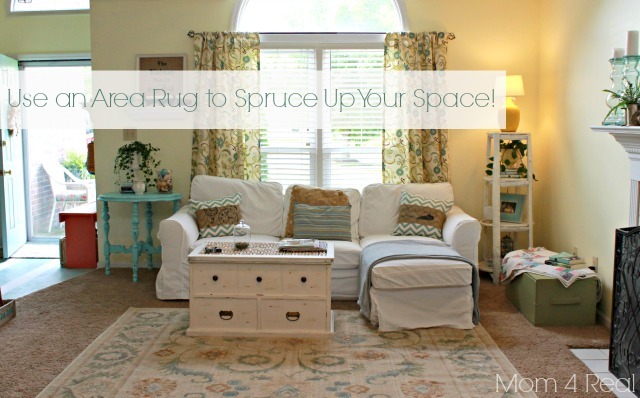 Did you know that you can use area rugs on carpet to spruce up your space? You totally can…I swear, it’s life changing! It’s a funny thing living in a home that you love in most ways, but detest in others. I guess we all live like that a little. I have slowly made changes to our home to make it ours, but there has been one thing that I knew I couldn’t change…our living room carpet. Here’s the thing…we just bought it a little over a year ago. We lived with the ugliest berber carpet for years, and when we decided to make the change, we went with carpet. We considered hardwood, but we have pets, and lots of traffic in and out, and I did not want to have to mop every five minutes. So, this is what we have. Don’t get me wrong, I love it! It’s so cozy and soft, and my feet rarely get cold in the winter. The only thing that has bugged me for the past year is the sea of brown. I just don’t love it. I love light and colorful, brown? Not so much. This is the before…don’t get me wrong, it’s pretty, and totally me, but that carpet just bugged me. I needed to break it up. I needed for the room to feel more put together and cozy. And, well, this rug totally did the trick. It’s the Mohawk Home Dennell Butter Pecan from Home Depot, and it brought the two sides of my room, which felt like they were an entire football field length of brown carpeting together! And? It’s just beautiful! So, it really accomplished t things…it brought my room together, and filled my desire for pretty at the same time! Matt’s chair, which just so happens to be brown, doesn’t look like it’s sinking in quicksand. It looks like it fits a little (believe me, it’s next on my list of things to change), on the other side of our living room. Now, everyone is happy! Kate loves it, and our horse-dog Blaine thinks he just got a new over sized dog bed because of how soft it is! He’ll definitely have to fight the rest of us for it! I have to tell you, this rug makes me completely happy! Not just because it solved my problem, but because it shows that you don’t have to buy all new floors to really change the look of your room! 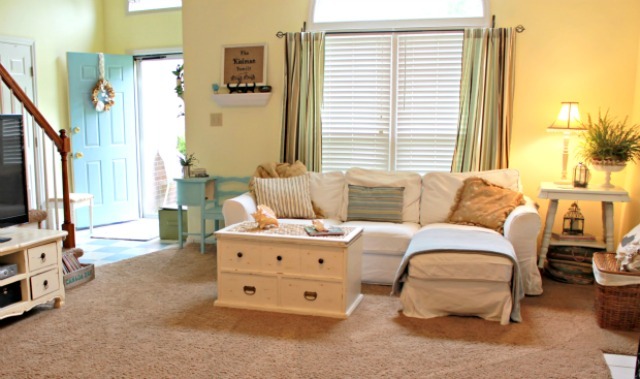 If you can’t buy new carpeting or hardwood floors, shop for a rug…it really does work! Thanks to the awesome folks at Mohawk, you have the chance to win an area rug of your choice!!! Say what? Yep…that’s what I said! To make it even better, you can enter here, and then jump over to Four Marrs and One Venus to enter there too!!! The winner may choose any Mohawk Home rug up to size 5×8 and under $150 valued on site!!! What a difference! The colors are perfect for your space too. The room really looks “finished” now. Girl…your room is rocking cute! This looks great, Jess! It totally pulls the whole space together! The rug in the picture is beautiful. I have a large media room that has an old red carpet. I would love to win and put something beautiful there. Umm.. hello gorgeous! Love the new rug! The rug is amazing!!!! Love the look! The doggies looks fabulous on in : ) hugs…enjoy the weekend! Great giveaway! 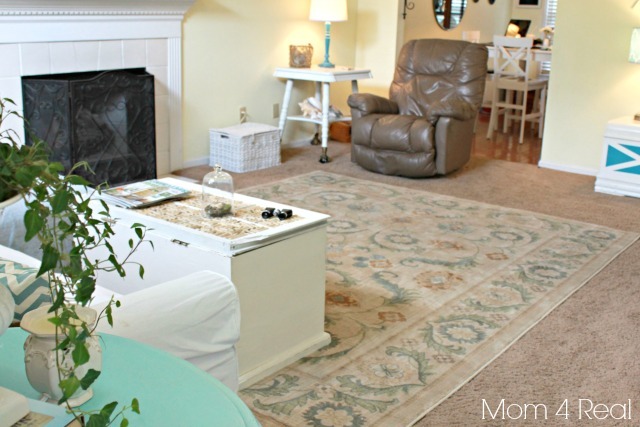 Love the colors in this rug and it suits your room to a T! 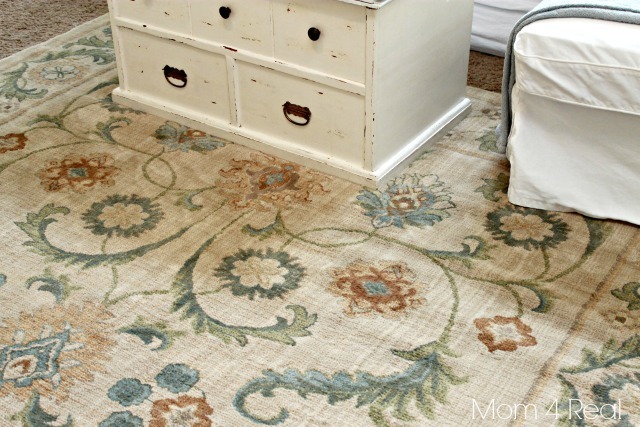 I love a beautiful rug….they make your home feel wonderful and warm! 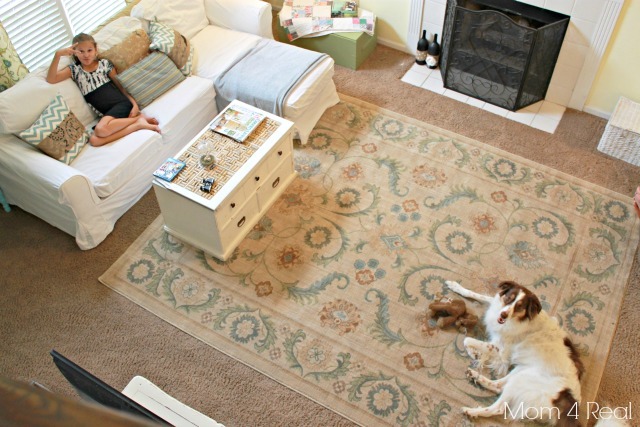 I love a wonderful rug…makes the home feel so warm! I would pick out the same rug colors you did! Just love it. Hi, I’m thinking of ordering this same rug! How has it held up? Is the binding around the edge unraveling at all? I don’t have a blog, but you can email me. Thanks! Hey! Your home decor is amazing! Where did you get your cozy sofa? Hi, Olesya! Thank you! 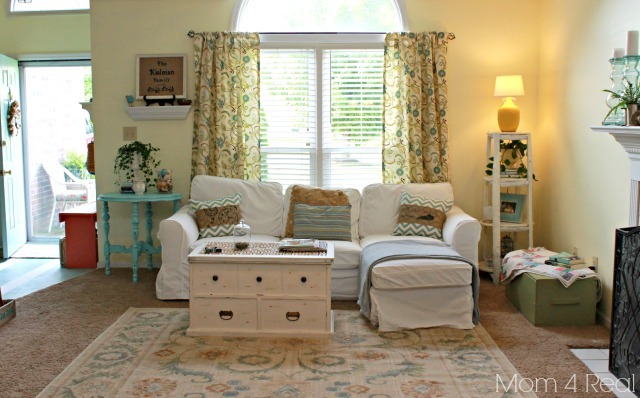 The sofa is originally from Haverty’s, but the slipcover is from IKEA, and they have a couch just like it that is inexpensive. It’s the Ektorp!